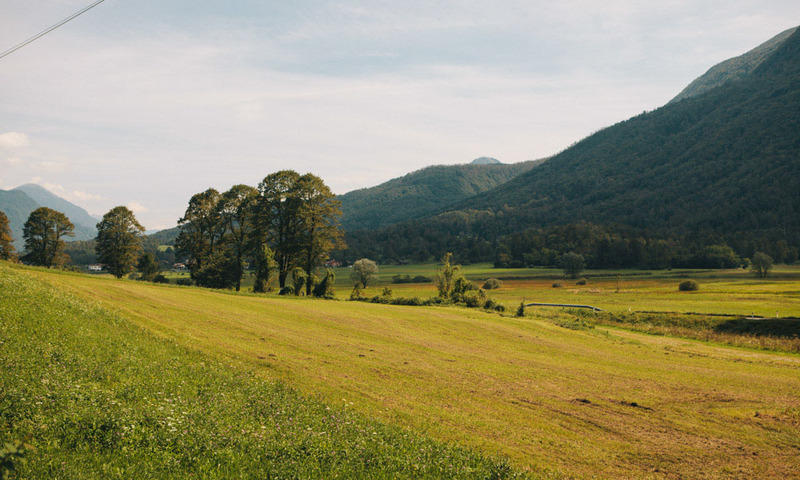 We had two priorities for our road trip around Slovenia – beautiful nature and amazing food. 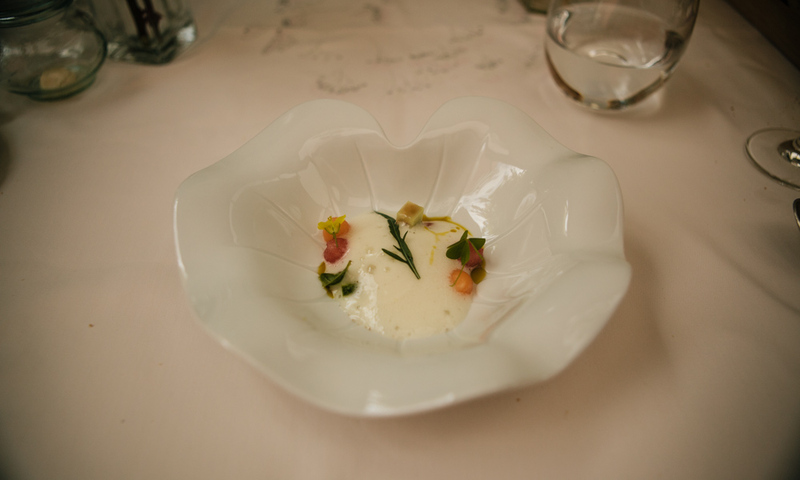 The country outdid itself on both counts and this post is all about the vegetarian Slovenia. We’d heard that Slovenia was good for vegetarians, but we didn’t expect it to be quite as good as it was. It’s definitely has some of the best vegetarian restaurants we’ve been to and is one of the best places we’ve been to for vegetarian food in Europe, especially the gourmet variety. Slovenia borders Italy, Austria, Hungary and Croatia and takes influences from all of them with its own special twist. Every restaurant we went to was more than happy to accommodate vegetarians, and we were continually surprised by the inventive dishes they came up with. This post isn’t for those looking for the cheapest eats they can find (although Slovenia has that to offer too). 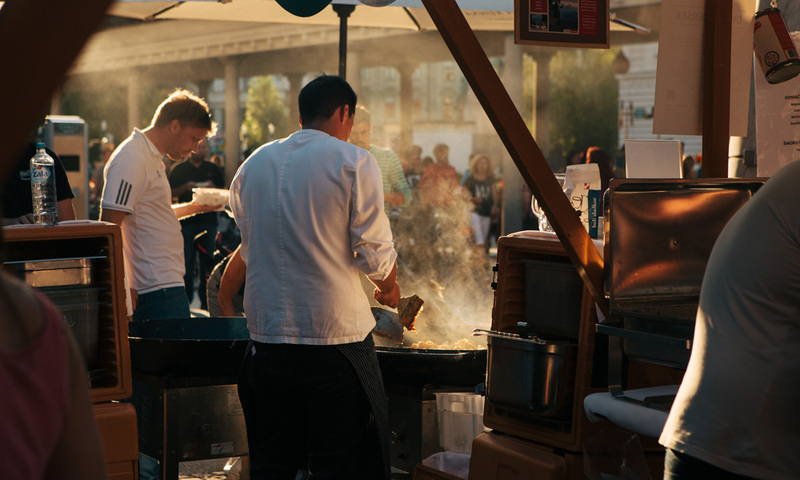 It’s about the food you eat as a treat – the destination restaurants that are a reason to travel by themselves. They are the meals you linger over, marvel at and dream of for years to come. Our mouths are watering at the memory. These aren’t strictly vegetarian restaurants in Slovenia, but they all had amazing vegetarian options. We had heard about Majerija from Erin and Simon at Never Ending Voyage and knew we had to visit. 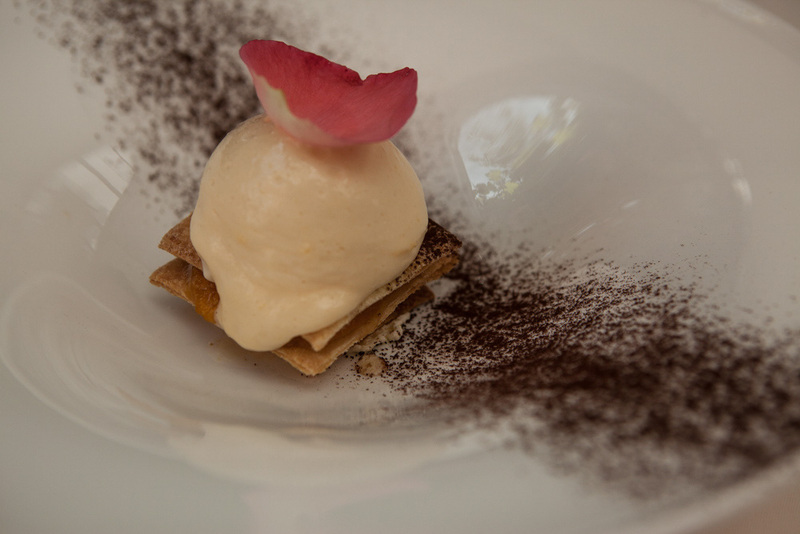 Set in the rolling hills of the Vipava wine valley, the 300-year-old house has been turned into a homely but high-end restaurant run by a chef and his schoolteacher wife. 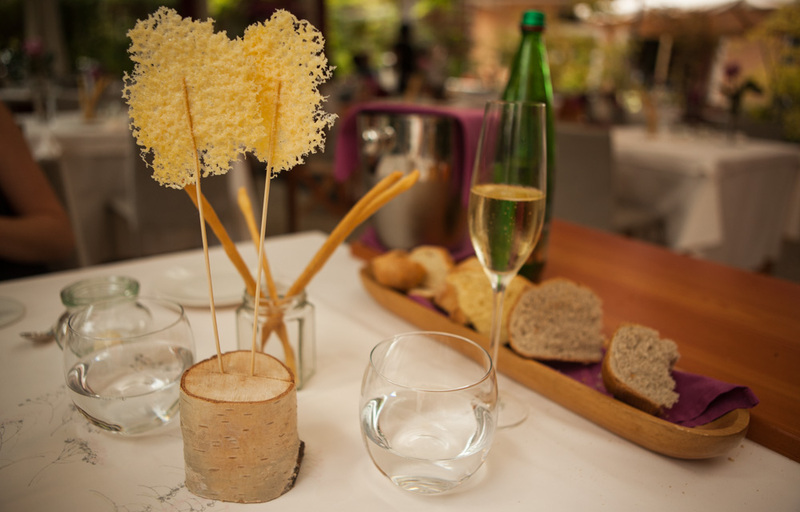 The cuisine is traditional with a modern twist, and the price is very reasonable for the quality of the food. 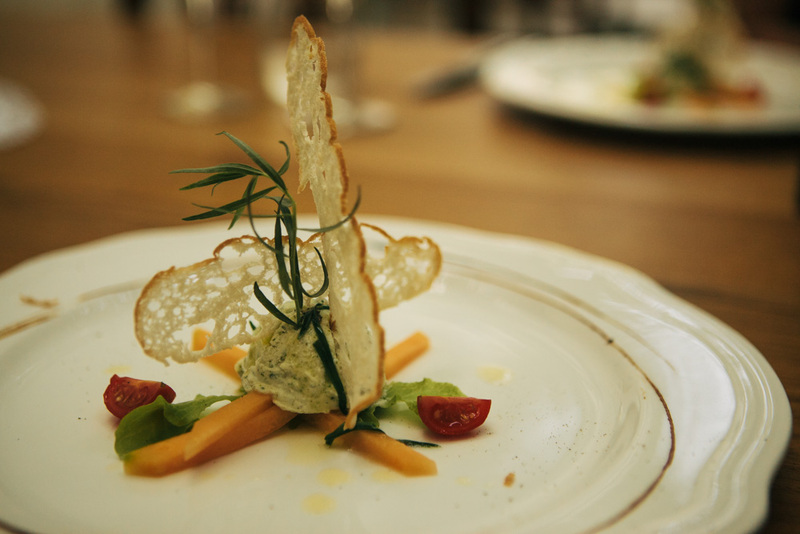 They had lots of great vegetarian options and we’re sure it must be one of the best vegetarian restaurants in Slovenia. It costs €24 for three courses, and then an extra €4 for each course on top of that (you can have up to 8!). The owners have also recently built a guesthouse on site, and we can only imagine how great the breakfast will be! A beautiful take on a bread roll. We loved these little wraps of cheese. Homemade ricotta with tarragon, melon and fresh tomato. 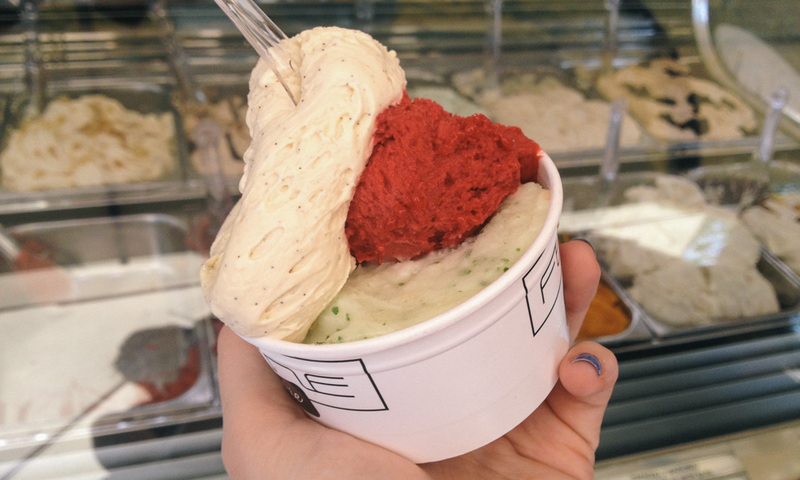 Three stuffed vegetables: zucchini with egg cream; tomato with pistachio; aubergine with cream cheese and pepper. 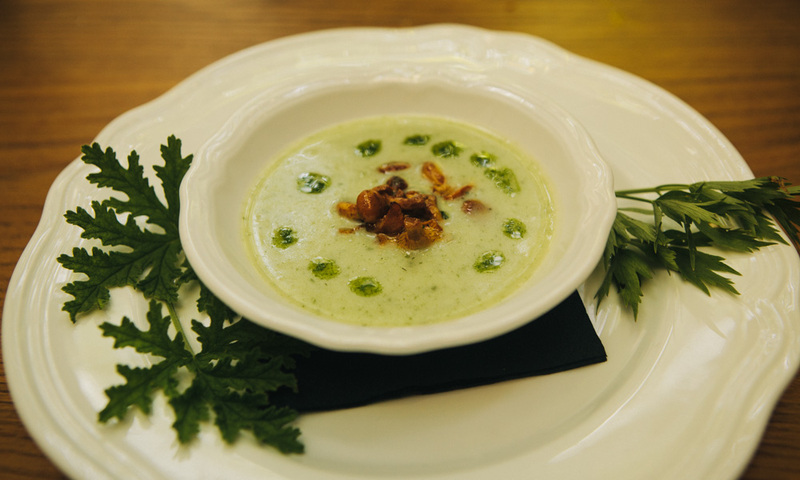 Vegetable cream soup with herb oil and stump mushrooms. 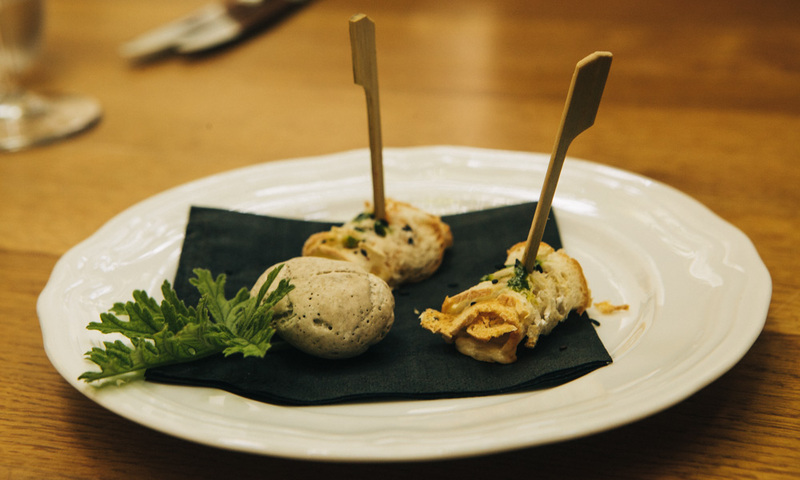 Mlinci, Vipava style, served with bolletus muchrooms and peas sauce. 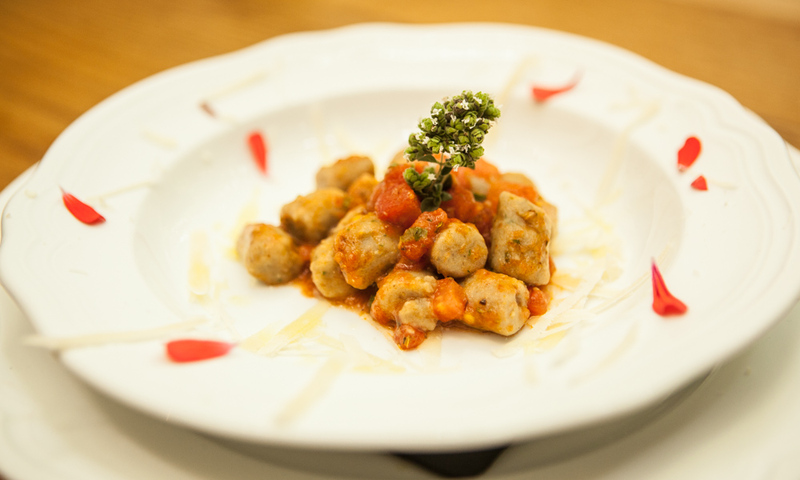 Aubergine gnocchi with tomatoes, oregano and lemon basil sauce. 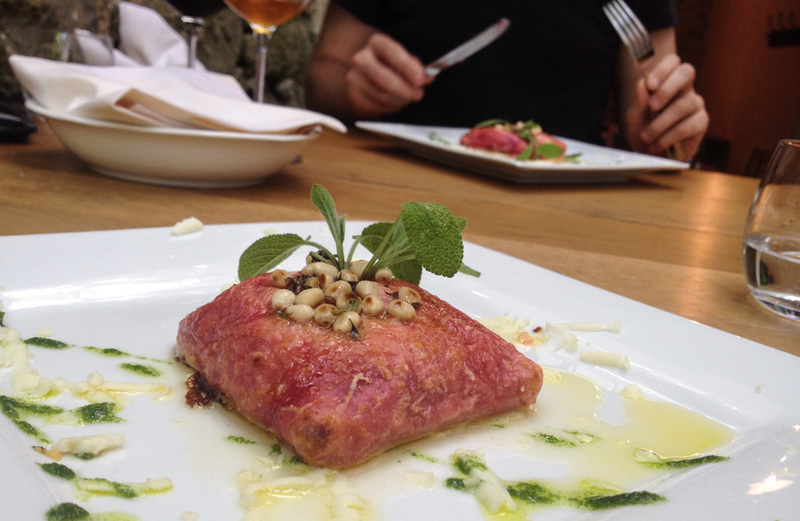 Crispy baked pancake with creamy red beet stuffing, pine nuts and lemon thyme sauce. And, of course, being in the wine valley, the whole meal was paired with beautiful wines. Steve and I particularly enjoyed the orange-coloured Ana Cuvée by Mlecnik. Much of Slovenia wine isn’t exported so it was a real treat to try it there. Other favourites were the Nafa rosé and the Špela and Pinela by Štokelj (named after the grape (pinela) and the current wine queen of Slovenia!). 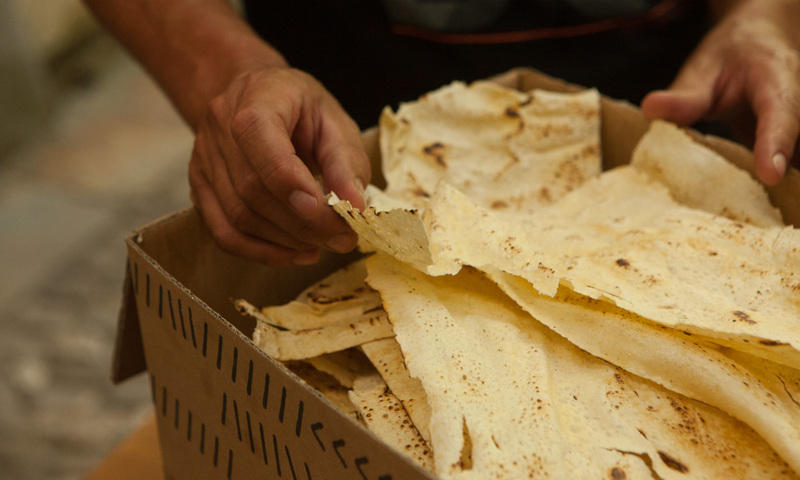 One of our dishes was Mlinci, a Slovenian / Croatian creation of extremely thin flatbread that is prepared by pouring boiling water over it, a little like pasta. This is Majerija’s homemade raw Mlinci. Like Majerija, Hiša Franko is a destination restaurant that attracts food lovers from far and wide. 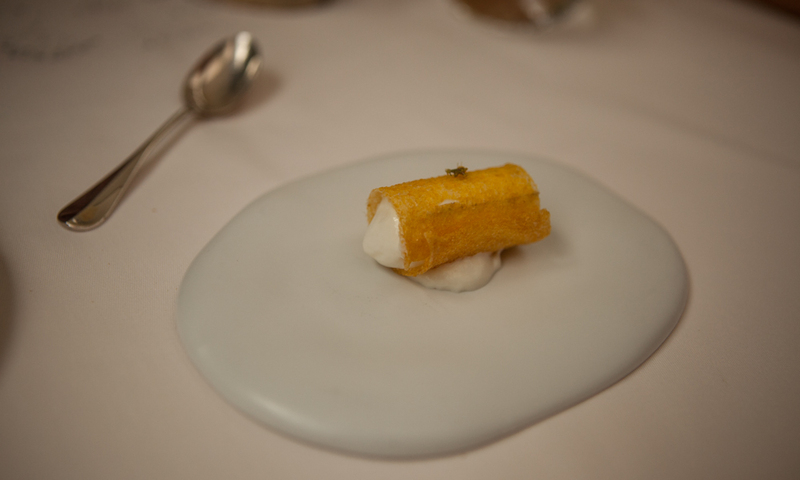 The quality of the food is so good that we think it may be on its way to a Michelin Star. 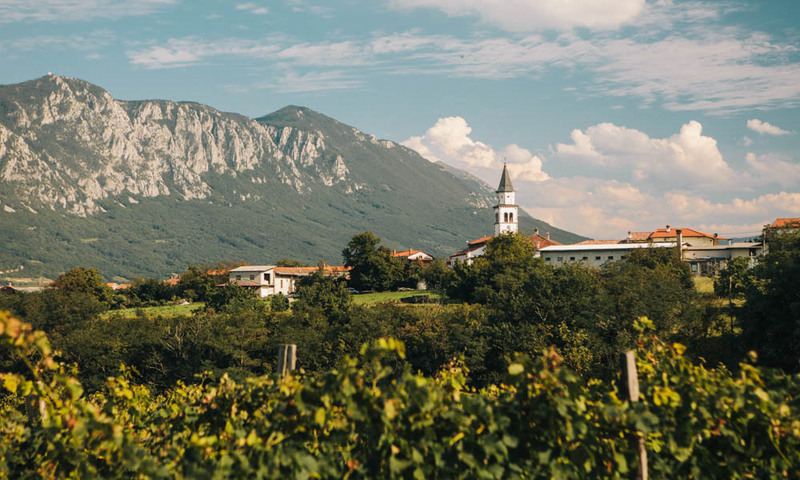 Situated at the entrance to the Soča Valley, just an hour from Vipava, it’s the perfect decadent lunch stop for a road trip through the mountains. It also doubles as a guesthouse with beautiful views across the gardens and out towards the mountains. 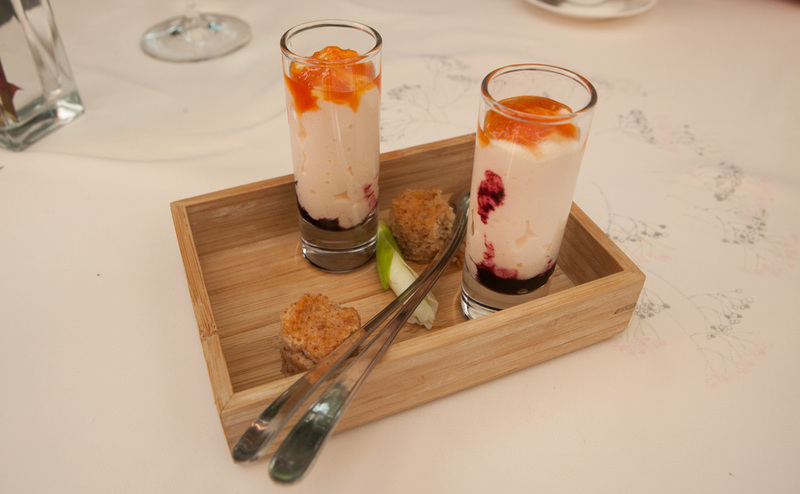 It’s definitely one for special occasions at €42 for three course and €60 for five. It’s certainly worth it for the taste! We knew we were somewhere special when the first thing to arrive was a lollipop made of cheese! A little appetizer of cottage cheese in a crispy polenta wrap. Gazpacho foam with melon and cucumber. 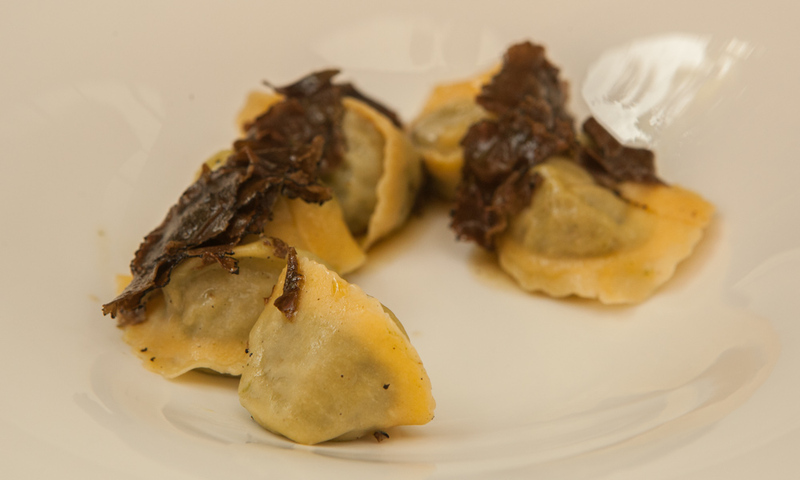 Ravioli of lovage with black truffle oil. 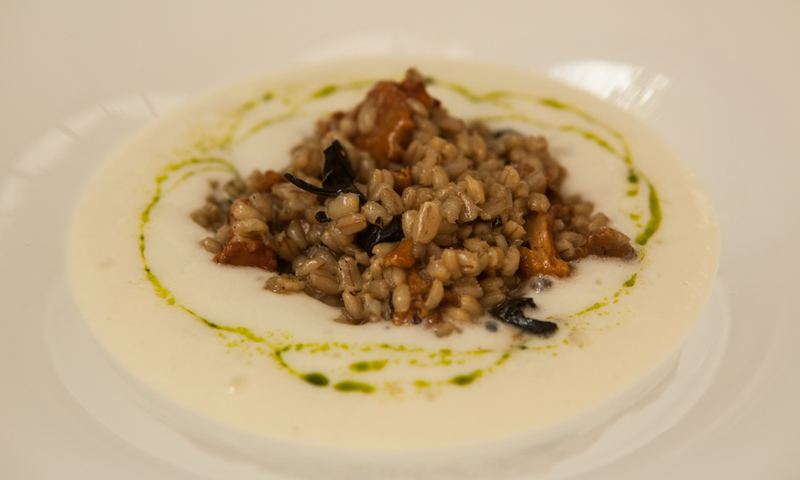 Barley risotto with chanterelles, sweet potato and herb cream. Mille feuille with biscuit, apricot, cream, coffee and salted caramel. And a final surprise of little cakes and a creamy berry dessert topped with apricot jam. 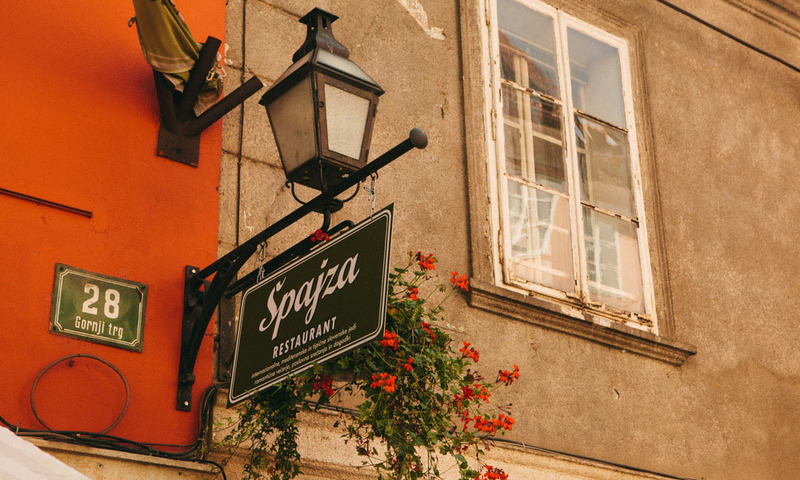 Ljubljana also has a wealth of good restaurants including the charming Špajza, tucked away in the city’s old town with a lovely sun-filled courtyard to enjoy your lunch. We wiled away almost three hours, just enjoying the food and wine – a perfect way to spend a holiday. 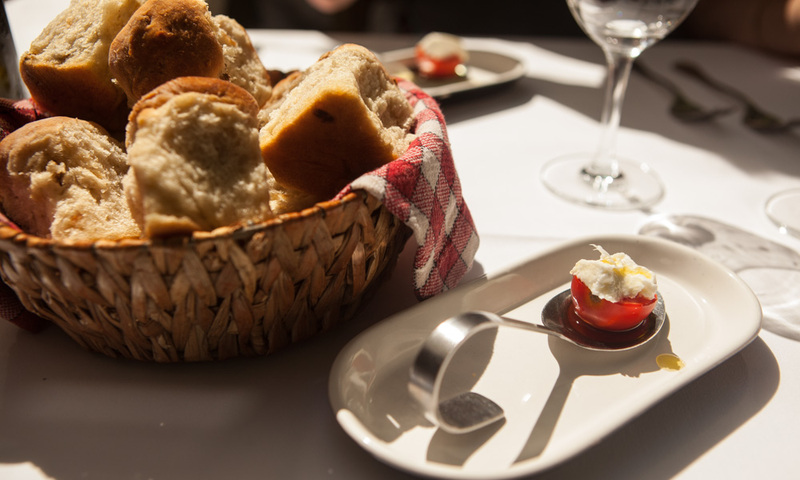 An appetizer of tomato, cheese and olive oil with tasty homemade bread. 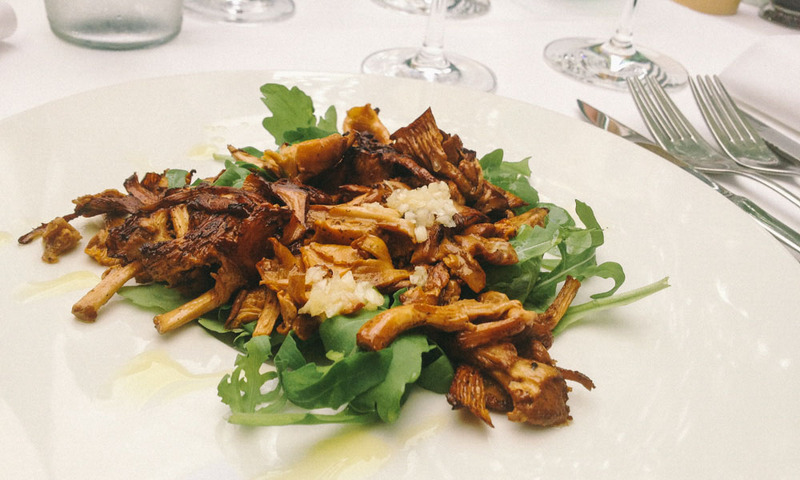 Wild mushrooms and garlic on a bed of rocket. 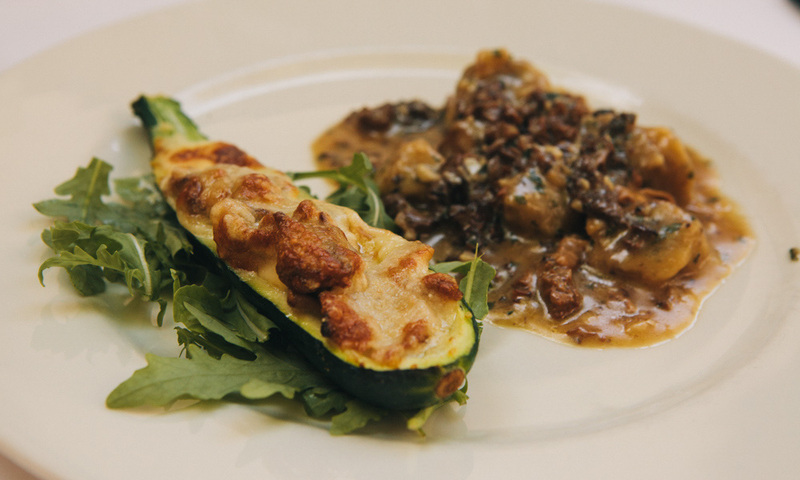 Stuffed courgette and mushrooms gnocchi. And, as with every meal in Slovenia, it was served with delicious local wine. 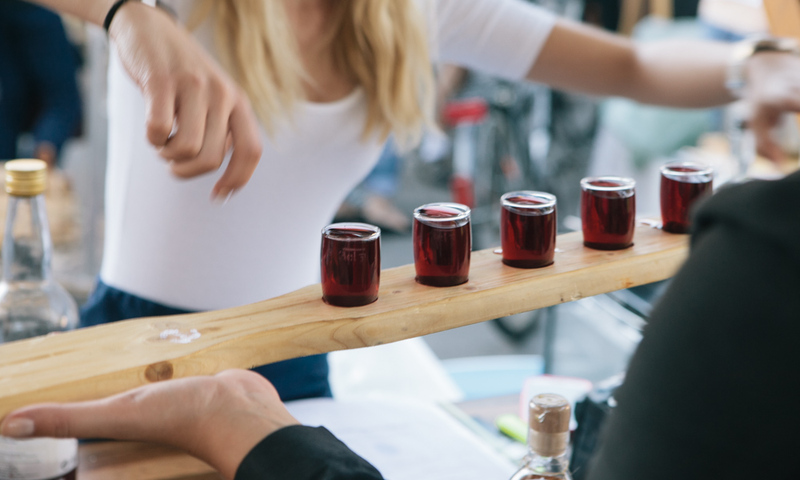 Some other notable treats in Ljubljana include the brilliant Open Kitchen market, which takes place on Fridays and is a hipster street food heaven. … and Fetiche beside the river. This post is part of the Must Love Festivals project. We were invited to Slovenia as guests of Spirit Slovenia, Visit Ljubljana and Expedia. All opinions are, as always, our own. 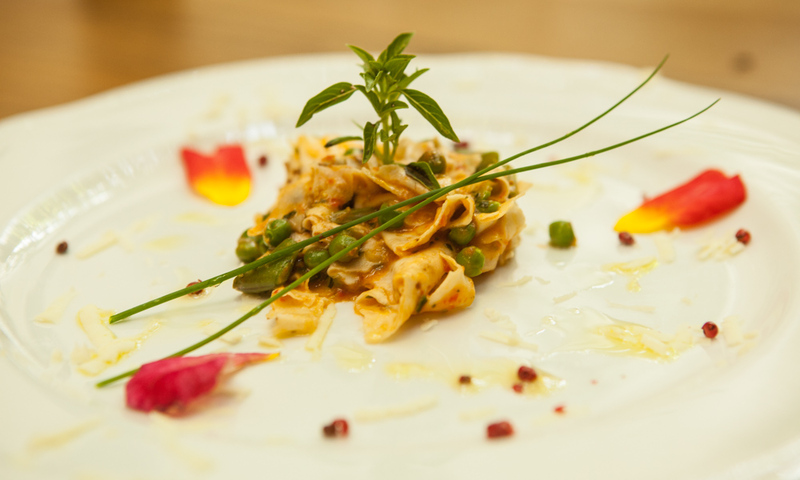 With food like this, you definitely don’t need persuading! Absolutely gorgeous photos. 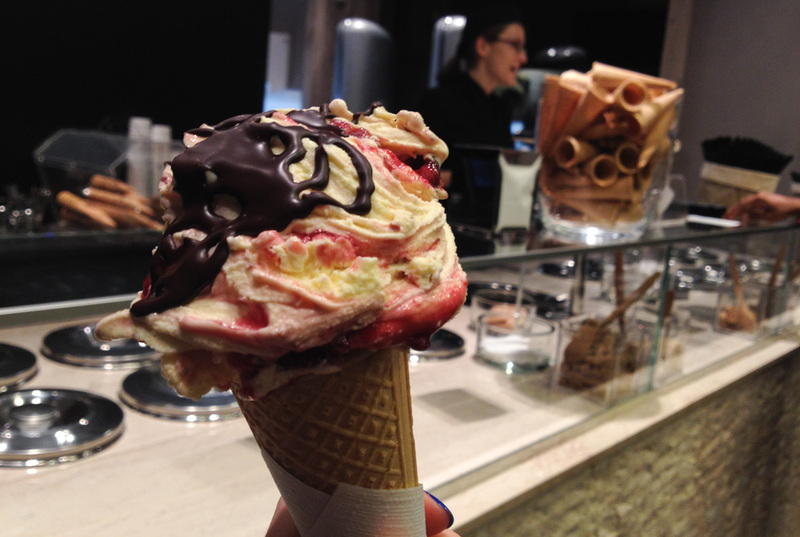 Eating my way around a country is one of my favourite ways of travelling. 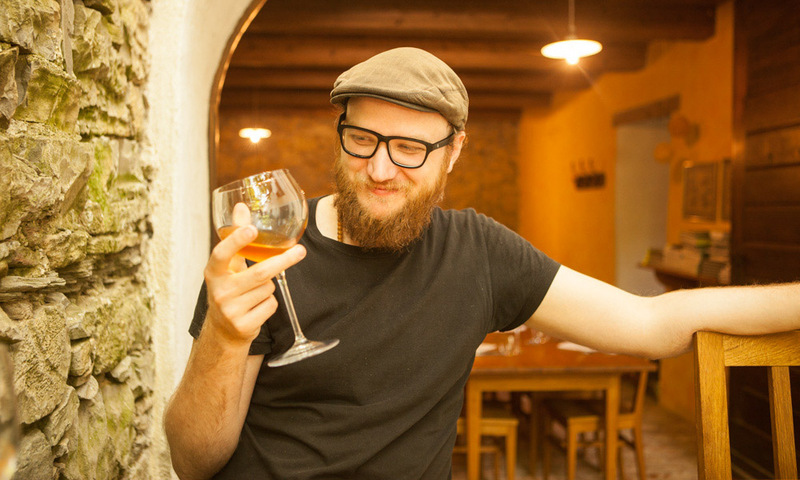 There is so much history and so many stories in local food, and by documenting all the things you ate and drank around Slovenia, you’ve given me a very good idea of the country and why I must pay it a visit! We’re definitely on the same page. Eating the way around a country is the best! 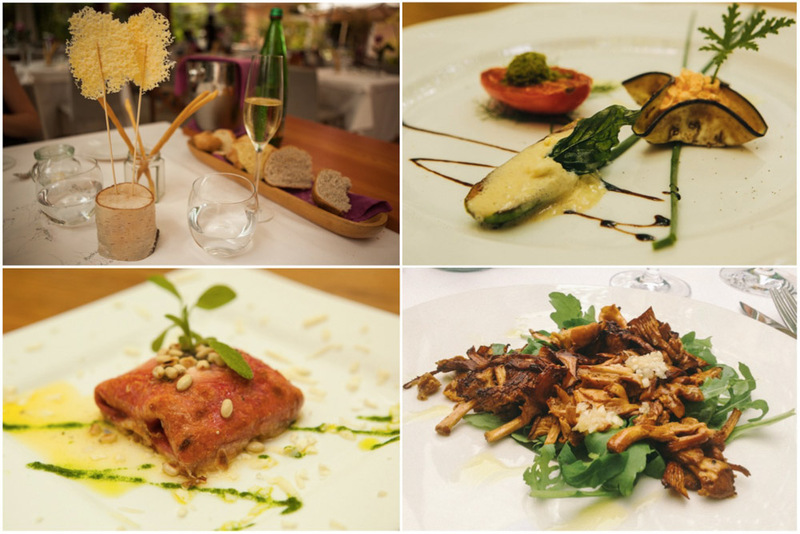 Such gorgeous photos – the food looks amazing and not really what I expected when I pictured Slovenian food! Neither did we! It was a very pleasant surprise! I’m salivating all over my keyboard. Too much information? Possibly, but who can blame me when you look at those photos! It has the same effect on us! Fascinating post! I’ve often thought about how certain countries, like Switzerland, are a Hodge podge of languages and cultures, but I never thought about the food! How exciting to travel to so many different countries while staying in Slovenia. Thanks again. This looks absolutely delicious. 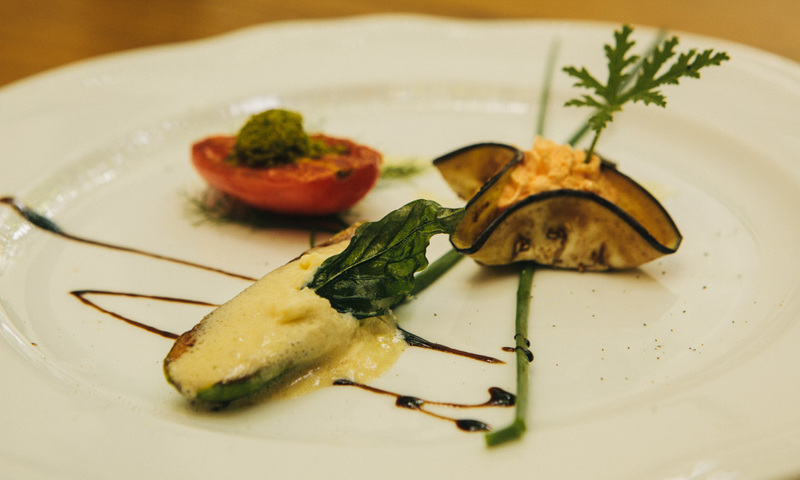 I had no idea, that Slovenia has such amazing vegetarian restaurants! Thanks for letting us know! So my question is: what did you actually eat there? Hi! I’m afraid we were there about four years ago so I can’t remember exactly what we ate – it was several courses and I know one of them was a delicious pasta dish. I would write to them directly and ask if they can accommodate you. I’m surprised it says that on the website as we were certainly accommodated for! Hope you get to go – it’s wonderful!